Why The Increase In Unalaska's Nonprofit Funding Requests? 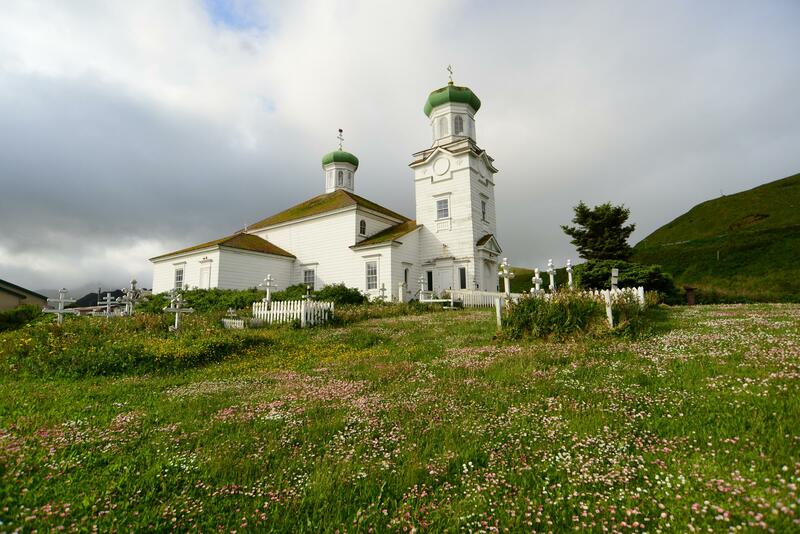 Russian Orthodox Sacred Sites in Alaska — on behalf of Unalaska's Holy Ascension Cathedral — is one of 12 nonprofits requesting almost $2 million in city grants. The City of Unalaska's nonprofit funding requests are up more than 50 percent this year. Driving the increase are two main factors: Half of the 12 applicants are asking for more than they received last year — and a new requester is asking for $391,784 in its first bid for city funds. The first-timer is Bering Sea Giving, an Anchorage-based nonprofit founded by former Unalaska resident Piama Oleyer in 2016. "Our goal at Bering Sea Giving is to find ways for elders to remain in their homes, in their communities, and in the region for as long as possible," she told the City Council on Tuesday. If funded, Oleyer said the organization would start working on its mission to provide end-of-life care in the Aleutian Islands so elders don't have die far from home in Anchorage. The city grant would fund almost 80 percent of its operations in fiscal year 2020, with most of the money going towards hiring a senior care administrator and a business manager. As for repeat requesters, six want more funding than they were granted last year, including Unalaska's Holy Ascension Cathedral. After receiving $50,000 for a new fire suppression system in the last budget cycle, Father Evon Bereskin said Russian Orthodox Sacred Sites in Alaska (ROSSIA) is looking for an additional $150,000 to continue restoring the 123-year-old church. "This phase of the project includes replacing the shingles, repairing rotten wood, and painting the roof and siding to help keep this National Historic [Landmark] building in place for generations to come," said Bereskin. The Aleutian Pribilof Islands Association (APIA) also wants an extra $84,850 to increase its behavioral health staff, while Unalaskans Against Sexual Assault and Family Violence (USAFV) is looking for a $22,951 boost to cover growing insurance and utility costs. In total, the requests add up to almost $2 million — about $700,000 more than the city's current spending goal. Councilor Roger Rowland said the council will have to decide between funding everyone and exceeding that self-imposed limit — or denying some of the requests. "I hope I didn't come across as an ornery ogre who doesn't want to give money," said Rowland. "Every single one of these program is deserving. I just want you to understand that these are not easy decisions. For every dollar that gets spent here, it doesn't get spent there." City officials are projecting a budget deficit of almost $8 million in the proposed $30.8 million operating plan. A big chunk of that deficit would come as a result of increased spending on nonprofits and capital projects — if the council chooses to fully fund those line items. With the state budget still up in the air, councilors have called for a conservative approach to the local fiscal plan. They'll continue discussing nonprofit grants at their meetings in April. Unalaska's nonprofits are up against a budget crunch. This year, a dozen organizations are requesting support from the City of Unalaska to the tune of almost $2 million. That's more than a 50 percent increase over last year — and about $700,000 more than the city's current spending goal. Unalaska's budget process kicked off in earnest Monday night, as city officials proposed a $30.8 million operating plan for fiscal year 2020. The budget is projected to run up a deficit of almost $8 million, even though most revenues and expenses are expected to remain status quo. The threat of state budget cuts could delay Unalaska's plans to renovate playgrounds, dredge the port, or complete other long-term projects. Last week, the City Council balked at the local capital budget proposed for fiscal year 2020, which would spend $23.5 million on about 30 projects. Councilor Shari Coleman said the city needs to be "much more conservative."